Flemish cartographer and geographer, credited as the creator of the modern atlas. (Ortelius was the Latin version of his real Dutch name Ortel.) He was a member of the influential Ortelius family of Augsburg, he traveled extensively in Europe. He is specifically known to have traveled throughout the Seventeen Provinces; south and west Germany (e.g., 1560, 1575-1576); France (1559-1560); England and Ireland (1571), and Italy (1578, and perhaps twice or thrice between 1550 and 1558). Beginning as a map-engraver, in 1547 he entered the Antwerp gild of St Luke as afsetter van Karten. His early career is that of a businessman, and most of his journeys before 1560 are for commercial purposes (such as his yearly visits to the Frankfurt fair). 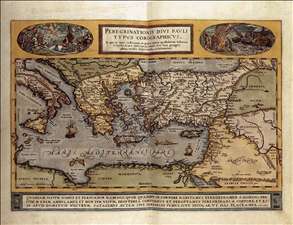 In 1560, however, when travelling with Gerardus Mercator to Trier, Lorraine and Poitiers, he seems to have been attracted, largely by Mercator s influence, towards the career of a scientific geographer; in particular he now devoted himself, at his friend s suggestion, to the compilation of that atlas or Theatrum Orbis Terrarum (Theatre of the World) by which he became famous. This was probably the first collection of maps in book form twenty years before Mercator published his atlas. In 1570, when the first edition of the Theatrum Orbis Terrarum was published, the word atlas was not in use yet. The engraver was Frans Hogenberg. The Theatrum Orbis Terrarum was so successful that it had to be reprinted four times in its first year of publication. Altogether the atlas was published in 42 editions from 1570 to 1612 and in 7 languages - Latin, German, Dutch, French, Spanish, English and Italian. A tremendous success for a cartographer in the 16th century! Ortelius was also the first to note the reference sources for his maps by mentioning other cartographers. See more details about "Image of the Pilgrimage of St Paul"